Abseiling is one of our more popular activities which takes us to some truly amazing locations. This easy to learn skill will open up more exciting opportunities for you as we use them for other outdoor adventures such as canyoning and climbing. Abseiling, also known as rappelling is a controlled descent of a rope allowing a person to get from the top of a cliff to the base of it safely. The abseiler is securely attached to the rope through the use of a harness and descending device which allows them to control their rate of descent and stop whenever they wish (to enjoy the view) before reaching the ground. During the descent you’ll get to see and touch some amazing rock formations and be exposed to views of wandering valleys and the tree tops below. 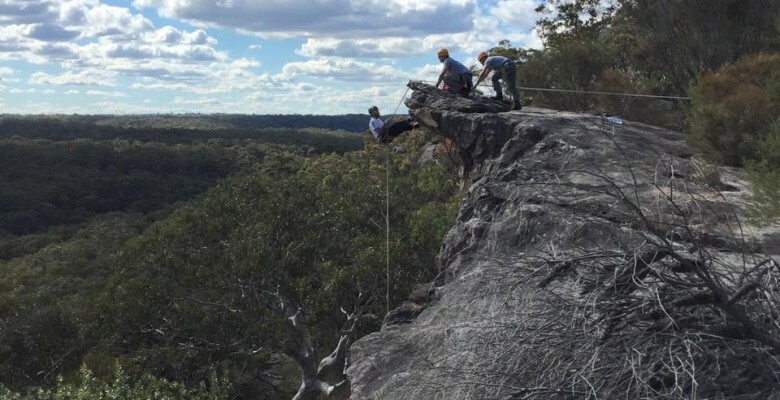 Typically at the end of any abseil you’ll get to enjoy a scenic bush walk back to where you started. UTS OAC facilitates at least four abseil skills courses each year for its members so they can confidently learn these skills. These courses are conducted by our experienced and skilled Trip Leaders, selected by our committee to teach this course.